•	Reuters reported that through their poll of crop market analysts it indicated that the U.S. corn harvest was about 20% completed (up 8% from last week) and the soybean harvest about 22% completed (up 11% from previous week) as of October 6. 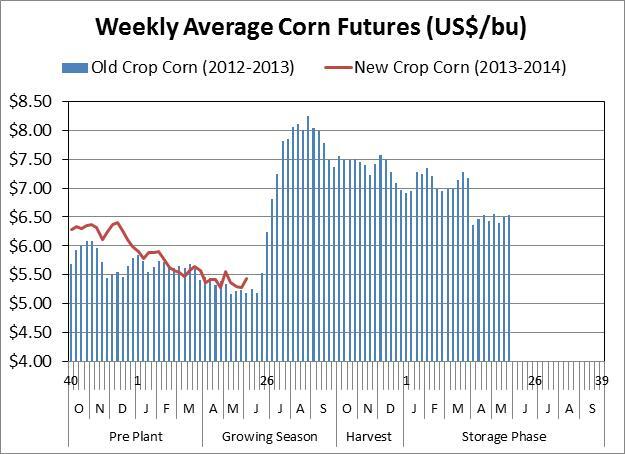 •	Both old and new crop corn is currently based off the December futures contract. 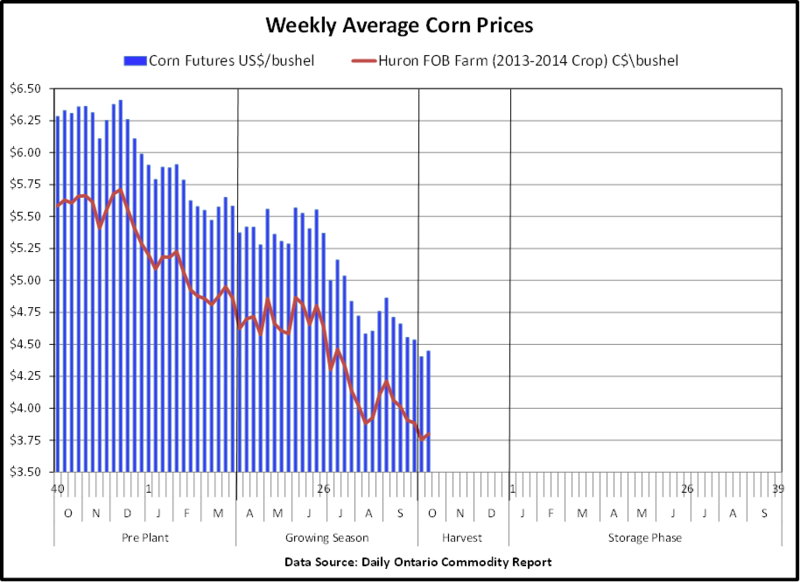 New crop basis has been holding at -$0.65 to -$0.70 per bushel in Western Ontario. •	Old crop corn basis varies widely depending on location, some users have come back into the market with the delay in this year’s harvest to-date and some are not making offers anymore. •	The old crop soybean prices now reflect the 2013-2014 crop that is being harvested and the new crop soybean prices now reflect the 2014-2015 crop that will be planted next spring. •	No weekly U.S. Crop Progress reports and October World Agricultural Supply and Demand Estimates reports are being released due to the shutdown of the US Government. •	The Canadian total wheat production is expected to rise 22.0% from 2012 to a record high 33.0 million tonnes. The increase is based on an expected record average yield of 48.0 bushels per acre (up from 42.6 bushels per acre in 2012) and an expected increased area of harvest (up 8.1% to 25.3 million acres). •	Ontario soybean production is estimated to decrease 13.2% to 3.0 million tonnes based on a 10.4% yield decline to 43.3 bushels per acre. •	Ontario grain corn production is estimated to decrease 1.6% to 8.6 million tonnes based on a decline in the harvested acreage to 2.2 million acres. Slightly tighter new crop supplies due to reduced new crop yields were reported in the USDA Supply & Demand Report which were below pre-report expectations. In general World grain prices for the crop year 2013-14 are expected to decline due to increased production being supported by normal to above-normal growing conditions across the major grain producing countries. In Canada, the grain and oilseed prices are forecasted to average 10 to 20 percent lower than 2012-13 due to lower international prices. Canadian prices may receive some offsetting support from a weaker Canadian dollar. World soybean production is forecasted to rise based on an expected record production in the United States, Brazil and Argentina (289 million tonnes, up from 285 million tonnes). World soybean carry-out stocks are forecast at a record 74 million tonnes which gives a stocks-to-use ratio of 21% for 2013-204 versus 19% for the 2012-13 crop year. For 2012-13, Canadian corn exports are forecasted to increase to 1.2 million tonnes due to tight supplies in the U.S. and a very wide Ontario corn basis. The nearby Chatham in-store elevator price was record high for the past crop year because of steady total domestic use and strong US corn futures prices. The forecasted 2013-14, seeded area in Canada is for an increase of 3% from the previous record of 2012-13. The forecasted production is up 1% to 13.2 million tonnes based on the larger area and the return to average yields. Total supply is forecasted to increase 2%, total domestic use is forecasted to increase by 1%, exports are forecasted to decrease due to a recovery in U.S. corn production and lower world prices and the carryout stocks are forecast to increase to a new record of 2.4 million tonnes. 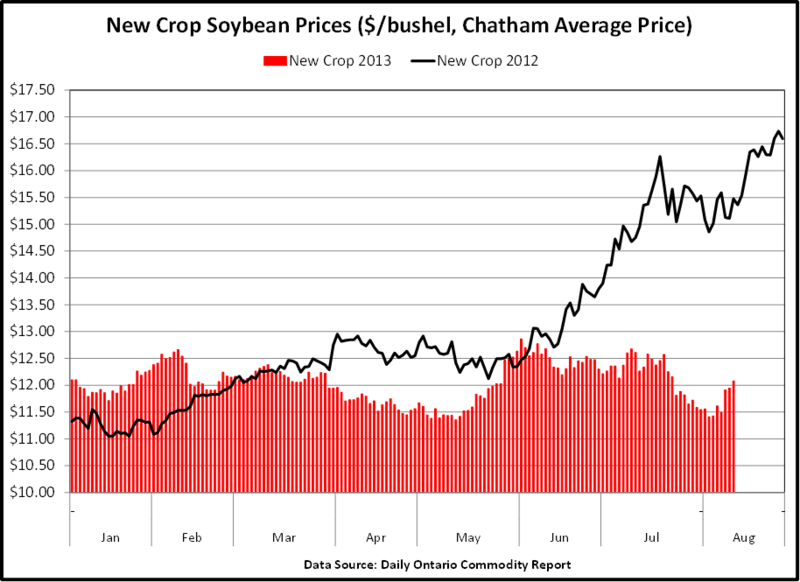 With the potentially larger North American and world corn crop for 2013, the Chatham in-store elevator price is forecasted to decrease ($4.40 to $5.20 per bushel). • Corn planting was 86% complete which is up 15% from last week. This compares to 99% last year and 92% complete on 10 year average. The market expectation was near 85%. • Soybean planting was 44% complete which is up 20% from last week. This compares to 87% last year and 65% complete on 10 year average. The market expectation was near 40%. • Spring wheat was 79% complete which is up 12% from last week. This compares to 100% last year and 89% complete on 10 year average. • US released the final rules to modify Mandatory Country of Origin Labelling (COOL) last week on May 23rd. The two major changes from the initial rule are the required labels are to include information about where each of the production steps occurred and it removed allowances for commingling of muscle cuts. The new labeling requirements go into effect on May 23, 2013 but there is a 6 month education and outreach program which means 100% compliance requirements will be delayed for six months. Both Canada and Mexico have stated they believe the amended rules still violate the World Trade Organization agreements and are prepared to take addition actions. • Smithfield Foods Inc. (SFD) has confirmed that it has agreed to be acquired by Chinese meat producer Shuanghui Group for about $4.8 billion. Disclaimer: This commentary is provided for information only and is not intended as advice. Global markets are trading slightly higher this morning. US unemployment for April drops to 7.5% (a 4 year low) and better than expected job growth while the European economy is headed for further slowdown and slower deficit cuts, according to Reuters. According to Agriculture.com, hog prices increased April 30 to the highest level since August 2012 on speculation that demand – which is seeing higher than expected volumes now – will be driven to even higher levels this summer. The demand is reported to be led by China, where consumers have concerns on locally-raised pork. Crops futures are trading modestly higher in the early session as investors express concerns that continued cold temperatures and snow forecasts across the US Midwest will put a dent into yields, according to Agrimoney.com. A 5% week-over-week gains in US export corn sales may also be a factor in this morning’s positive momentum. Disclaimer: This commentary is provided for information only and is not intended as advice. Prepared by Jennifer Stevenson, Ontario Ministry of Agriculture and Food and Ministry of Rural Affairs.